Home Kidney Disease Where are our kidneys? 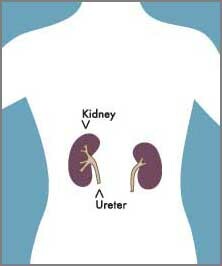 The kidneys are two purplish brown bean-shaped organs located just below the ribcage on either side of the spine in the small of the back. The right kidney is a little smaller than the left and is situated slightly lower to accommodate the liver. In the average adult, each kidney is about the size of a fist, 4-5 inches long, 3 inches wide and about 1-2 inches thick, weighing 4-6 ounces.